Image by Winslow Homer entitled "The Christmas-Tree." Harper's Weekly, December 25, 1858. The tradition of decorating a Christmas tree for the delight and amusement of young and old dates back to 16th century Germany. Still many of us find ourselves asking, “How should I trim my tree this year?” or "How should I decorate my home for the holidays?" I thought it might be fun to share some of the ways our Victorians friends decorated their Christmas trees and homes. Who knows? 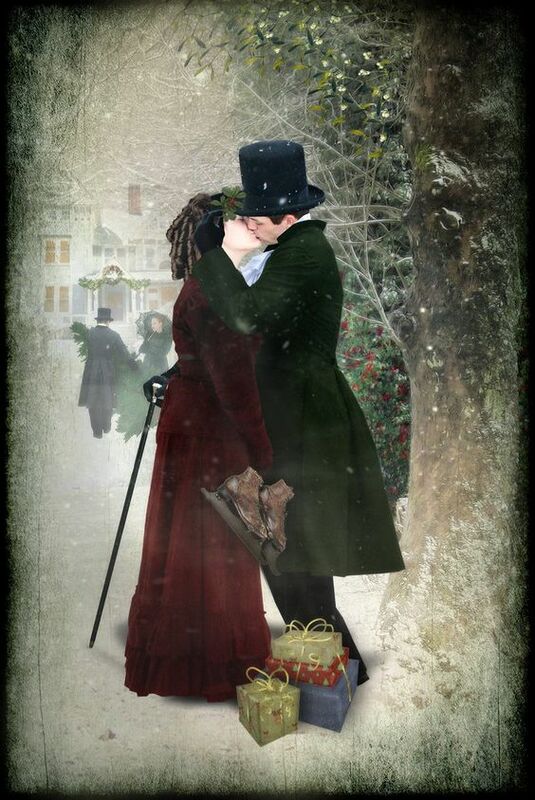 Maybe some of us will decide to have a Victorian Christmas theme this year. Of course, I hope others will share their ideas as well. We have a lot of talented folks on CWT who make holiday crafts and decorations. This is your chance to show off your handiwork my friends and give the rest of us some ideas! I've been thinking about this too! I suspect this thread will be a lot of fun. I suspect we can make sure of it! My grandparents told how they decorated trees 'back in the day'. Strings of popcorn, ribbons, delicate glass ornaments, real candles attached to the boughs. If you were going to leave the room, you put out the candles. 'Stocking stuffers' were walnuts and oranges. The big event was Christmas dinner. It was a time for visits to the neighbors and singing Christmas Carols. It was, indeed, a simpler time, especially for the ordinary family. I suppose the wealthy then- as always- had fancier, but not happier Christmases. The only tree lights available then were candles. Since we have much safer electric lights, candles are probably not a great idea, and they last only about an hour. I doubt if tree candleholders are available any longer--they can be made out of wire, but it's a rather lengthy process. For two years of my childhood, we lived where there was no electricity, and the candlelit tree, IMHO, was awesome. If you want to try it, have several full buckets of water handy, and be very careful in placing the candles so that they're stable and won't catch the branch above! I'd recommend candle-shaped electric lights, if you can find them--they last longer and won't result in a Christmas Eve bonfire! Stringing popcorn and cranberries alternately on a strong thread was both pretty and economical. IMHO, much nicer than tinsel. Of course if you leave the tree up too long, the cranberries will rot and fall off the thread. My grandparents told how they decorated trees 'back in the day'. Strings of popcorn, ribbons, delicate glass ornaments, real candles attached to the boughs. If you were going to leave the room, you put out the candles. We may have our Germans to thank for that. "The first Christmas tree was introduced into England in the early 19th century. In 1841 the German Prince Albert, husband of Queen Victoria, decorated a large Christmas tree at Windsor Castle, reminiscent of his childhood celebrations in Germany (the Christmas tree had been a deep-rooted German tradition since the 18th century)." "Soon after, it became a Victorian Christmas tradition in England to set up a large tree at Christmas and decorate it with lighted candles, candies, and fancy cakes hung from the branches by ribbon and by paper chains." "If you can obtain the tree from some pine woods near at hand, select a finely shaped fir balsam or spruce, with firm branches, and about nine or ten feet in height. Then spread a large sheet over one end of the parlor carpet, and put a good-sized tea chest in the center of it. The lower limbs of the tree must be sawn off so that it can be firmly fixed into the box; and any small heavy articles, like weights and flatirons, can be put in for ballast, to keep the tree firmly in place. Then fill up the box with hard coal. The chest must be concealed with some pretty material; old curtains will answer the purpose, or the American flag; and a white furry robe is also suitable. Drape these articles close to the tree, and let them trail a little on the floor, to make a graceful sweep." @WJC and @MaryDee, I have always wondered about candles on a Christmas tree. The idea sounds beautiful, but scary! Queen Victoria, Prince Albert, & their family from the 1848 Illustrated London News. In 1847, Prince Albert wrote: "I must now seek in the children an echo of what Ernest (his brother) & I were in the old time, of what we felt & thought; & their delight in the Christmas-trees is not less than ours used to be." He would decorate the trees himself with sweets, wax dolls, strings of almonds & raisins, & candles, which were lit on Christmas Eve for the distribution of presents, relit on Christmas Day, after which the tree was then moved to another room until Twelfth Night (January 6). The Queen's journal of 1850 describes the scene: 'We all assembled & my beloved Albert first took me to my tree & table, covered by such numberless gifts, really too much, too magnificent." "The 7 children were taken to their tree, jumping & shouting with joy over their toys & other presents; the Boys could think of nothing but the swords we had given them & Bertie of some of the armour, which however he complained, pinched him!" Paging @2/241 . Candles on the Christmas tree - yea or nay? Holly, Ivy, and everyone's favorite ~ Mistletoe! Used for decoration around the house. "These common plants all produce winter berries and were held to be "magical" long before Victorian times. The holly berries were said to repel witchcraft and a berry-laden sprig would be carried into the Victorian house by a male and used to decorate the Christmas pudding. 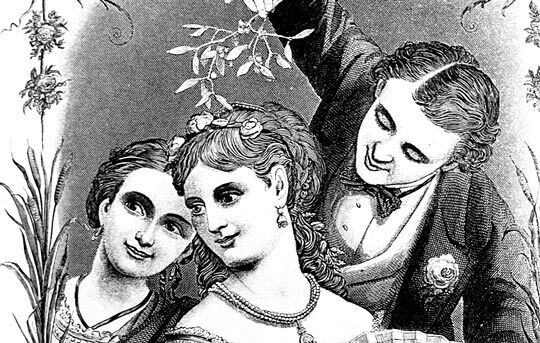 Mistletoe had pagan origins and in Victorian times it was not allowed in churches. 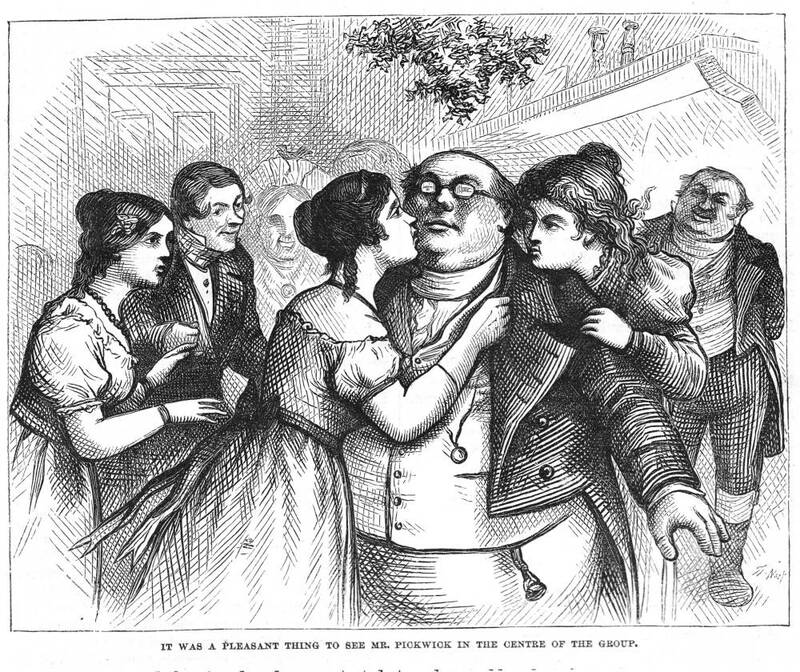 However, kissing under the mistletoe was popular in Victorian homes. After each chaste kiss a white berry had to be removed from the sprig until there were none left - and no more kisses were to be had." Sneaking up from behind ~ a common and often successful maneuver. The old "I say. Will you look at that. I'm under the Mistletoe. You're under the Mistletoe. It's fate." "Now the tree is planted, and we must proceed to decorate it. Make chains of popped corn, strung together with needle and thread; at least a dozen yards will be none too much for a large-sized tree, and the pure white festoons entwined amid the dark green branches of the tree produce a fine effect. We must also have chains made either of glazed scarlet, gilt or silver; cut the paper into small strips, four inches long and not half an inch in width; fasten the two ends of each strip together with flour paste, and make half of them into rings; then take the rest and make into similar rings, but first slip each strip through two of the dried rings before joining the ends. In this manner all the slips of paper are interlaced, and we have a chain of rings which will greatly adorn our tree. They must be festooned in long, graceful loops from limb to limb, and the effect is very charming." I think you'll like this one @Lori Ann! I had no idea the paper chain tradition was so old. I honestly thought it was some weird thing our 1970s Kindergarten teachers came up with in art class. And is that a basket of booze under the tree? Gott im Himmel! I hope she doesn't knock one of those candles off the tree! When you say candles, I would think it important to remember the water buckets parts. I know you do, but others not so much. I have seen Christmas trees burn. They go up very fast. A lot like the deep fried turkey stories. I have no doubt the candles would create a beautiful effect. I like my lights too much, especially the bubble lights. I have seen a historic house's Christmas tree with candles. It was beautiful. I notice in the engravings, the branches are farther apart than trees today. I wonder if it was certain type of fir used. you lived in a place with no electricity. I lived in a place with no heat in my room. Some 1840's houses were made that way. Ours was, and I wanted that upstairs bedroom. Hot in the summer too. The old Christmases were the best. Of course there was plenty for the children to do. Their activities added to the entertainment of the long evenings during the Christmas season. The children assisted in covering English walnuts with tinfoil or gilt paper and in filling small apples with cloves. The latter served to keep moths from the drawers of bureaus. They also made inexpensive, but acceptable presents.